Simply delicious meat from NewGrass Farm is for people who want to savor their food, because they know that it was raised right. It’s for people who want food that is good for their health, without compromising the environment. It's for people who look at the true cost of food, and want the best value not only for themselves, but for their children and their community. Anyone can put a cow out on pasture and call it grass-fed, but it takes a great deal of skill to produce a consistently high quality product on pasture and hay, alone. Far too often, grassfed beef producers send cattle to market that are not of good quality, so the meat will be tough, dry, tasteless, gamey, or mushy. We avoid these problems through careful management of our pastures, and hay, as well as using judicious selection of good cattle genetics. Additionally, each carcass is personally inspected before the meat is packaged for you. What that means is that we can confidently guarantee that you will enjoy our beef, or your money back. "I cooked the chuck roast last Sunday - I do believe that was the absolute best roast that we've ever had. My husband said it was even better than his mother has ever made :o) I can take some of the credit for the roast but the beef was amazing!! We've tried the ground beef which was also excellent and are looking forward to see how grilling works out for us. You and your family will enjoy the wonderful flavor of delicious, dry-aged grass-fed meat every time. Grass-fed beef has many health advantages over grain-fed beef, however, most of the grass-fed beef on the market is wildly inconsistent in taste & texture. It's hard to choke down poor quality, tough, gamy meat, regardless of how good it might be for you. Our goal is to provide you with a consistently high quality, tender, and tasty product. Each steak should be as good as the last one. Eating healthy food is one of the most important things you can do to improve your health. 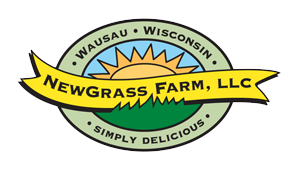 Choosing NewGrass Farm pasture-raised and grass-fed meat is a pleasant, easy, way to eat healthy, without having to drastically change your eating habits, especially if you have children. You’ll eat significantly more nutrients than you would from feedlot beef. More Vitamins A, C & E, and more calcium. 4 times more omega 3’s, the good fat! 5 times more CLA—a potent cancer fighting compound. Less total fat, less saturated fat, fewer calories and less cholesterol. By choosing our beef you help the environment: Our rotational grazing system virtually eliminates erosion, removes carbon dioxide from the air, and improves the soil. Well managed pastures also allow many bird species to successfully nest and raise offspring. You support the local economy 95% of each dollar you spend on our meat stays in the area. Antibiotics: We don't use antibiotics except when necessary to save the life of a sick animal or reduce it's suffering--so far, this has never happened on our farm. That's because, raising cattle right keeps them healthy. Almost half the meat and poultry sold in the US is likely to be contaminated by highly dangerous bacteria, according to research published in April 2011 in the scientific journal, Clinical Infectious Diseases. The study estimates that 47 percent of the meat and poultry on US supermarket shelves contains the bacteria staphylococcus aureus ("Staph"). It is not, however, among the four bacteria—Salmonella, Campylobacter, E. coli, andEnterococcus—routinely tested in meat by the US government. "Densely-stocked industrial farms, where food animals are steadily fed low doses of antibiotics... [are] ideal breeding grounds for drug-resistant bacteria that move from animals to humans," according to the report. Lance B. Price, Ph. D., senior author of the study, stated that “The fact that drug-resistant S. aureus was so prevalent, and likely came from the food animals themselves, is troubling, and demands attention to how antibiotics are used in food-animal production today. Antibiotics are the most important drugs that we have to treat Staph infections; but when Staph are resistant to three, four, five or even nine different antibiotics -- like we saw in this study -- that leaves physicians few options," Price said. Did you know that an FDA survey in 2009 found that animal livestock production in the U.S. used 29 million pounds of antibiotics in 2009? That's a tremendous quantity of antibiotics, and is one of the primary reasons why antibiotic resistant strains of disease are a major cause of concern. For instance, antibiotic resistant MSRA now kills more than 19,000 Americans each year--that's more than AIDS! Antibiotic resistant MSRA has been documented on farms that overuse antibiotics. Interestingly, Iowa researchers have found antibiotic resistant MSRA on feedlot hog farms, but not on organic hog farms. The large cattle and hog feedlots defend their use of antibiotics by saying that you wouldn't withhold antibiotics from a sick child, so neither will we withhold them from a sick animal. While that might be true, it begs the question as to why there is so much sickness that requires the use of antibiotics. As mentioned above, our livestock rarely, if ever, get sick. Lastly, did you know that most beef cattle, hogs and chickens are actually fed antibiotics in their daily feed ration whether they or sick or not? While you might treat a sick child with antibiotics, if needed, you surely wouldn't put them on his/her breakfast would you? That's what feedlots do. Artificial hormones: 70-80% of cattle are injected with artificial hormones, elevating hormone levels in meat, and in the environment. Because one study has already shown that hormone use in beef may promote breast cancer, the health experts who run the website Breastcancer.org, recommend that you avoid consuming meat from cattle injected with hormones. Beta-agonists, such as ractopamine, are a type of drug fed to beef cattle and hogs to increase lean muscle mass and reduce fat. This drug is banned in over 150 countries, because it causes a great deal of stress in cattle and hogs, often causing seizures or sudden death. Another problem is that it is fed right up until slaughter, and therefore, residues from this drug are often found in the meat sold at the grocery store. Asian countries such as Taiwan and Korea often reject shipments of U.S. meat because of ractopamine residues, but the USDA and FDA don't even test for the presence of this drug in the U.S. meat supply. Ammonia. Approximately 80% of the ground beef and hamburgers on the market contain a meat by-product that is treated with high levels of ammonia to kill e-coli, though this process is not very effective at doing so. By law, the added ammonia does not have to be mentioned as an ingredient on the label, however. you can often smell it when you cook the meat. Genetically Modified Grains. All feedlot cattle, hogs and chicken are fed genetically modified grains. We still don't know for sure if this effects their health or ours. However, there is now plenty of research that shows genetically modified corn, soybeans, and alfalfa contain significantly lower levels of key minerals, such as calcium, zinc, manganese, and copper, than non-GMO varieties. Herbicides and Pesticides We never use pesticides or herbicides on our pastures or hay. Even small amounts of these can mimic hormones that alter our health. These chemicals gradually accumulate in the environment causing all kinds of problems. They have been scientifically linked to an increased risk for cancer, ADHD, Parkinson's disease, birth defects, memory loss, and depression. During the summer we are at the VFW Hangar Lounge parking lot at 388 River Drive, on Saturday mornings, from 8:00-noon from the beginning of May through the end of October. Find us at the Wausau Area Boys and Girls Club, 1710 2nd St., Wausau, on Saturday mornings, 8:00-noon, from the beginning of November until the end of April. Or you can give us a call or email to arrange home pickup or local delivery.